Many thanks to Mark Leaver for sending me an MMS with this photo of work underway on the new Waitrose store at Hopwood Park Services on the M42. Supposedly due to open in February (though there looks a fair bit of work to do yet), the store will be the sixth to open under a franchise agreement between Waitrose and the motorway service area operator Welcome Break. As a fan of Waitrose, I do worry a little about the retailer stretching its brand too thinly – after all, there has to be some point at which Waitrose becomes so ubiquitous it’s no longer a special experience to visit one of its stores. However, I was quite impressed when I sampled one of the first Welcome Break stores at South Mimms[broken link removed] back in May, and appreciated the convenience of being able to pick up some essential items having flown back into the UK late on a Saturday evening. Looking forward, I suspect that the success of the venture will depend upon Waitrose’s motorway stores replicating as far as possible the excellent customer experience and stock availability offered by its regular shops – something that, in my experience of visiting its equivalent Moto stores, M&S Simply Food does not always manage to achieve. Next story Tamworth Market: the worst street market in Britain? 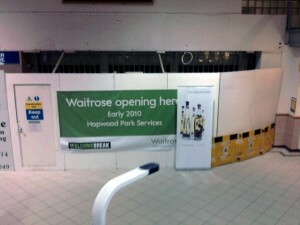 Soult's Retail View» Blog Archive » Well, that hasn’t taken Waitrose very long at all! 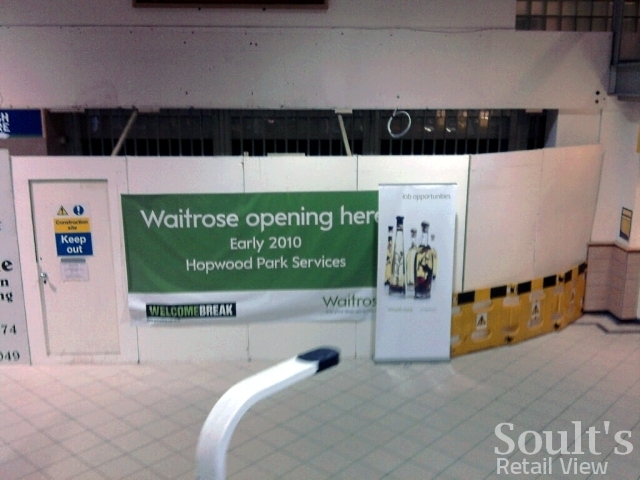 Soult's Retail View » Waitrose Hopwood Park now open!